Update: 4PX uses SingPost as their local delivery agent. So the package arrived very quickly after the custom was cleared. The others use courier like TOLL/Network Courier/Citylink Express. All those took 1 week minimum to deliver after the package arrive in Singapore. 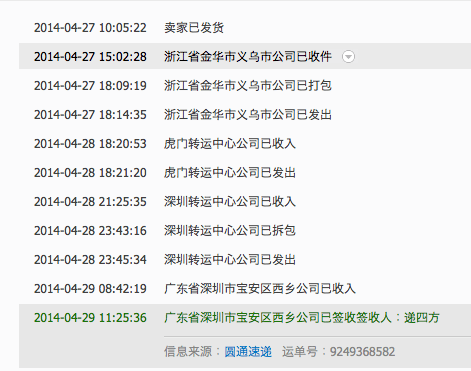 I have been buying from TaoBao (淘宝) for quite a long time. TaoBao is the equivalent of eBay / Amazon in China, just probably few times bigger maybe. I have been impressed with the variety of products and the price of China made goods. And while prices are low, quality is not compromised. I will share more on my experience in the future. 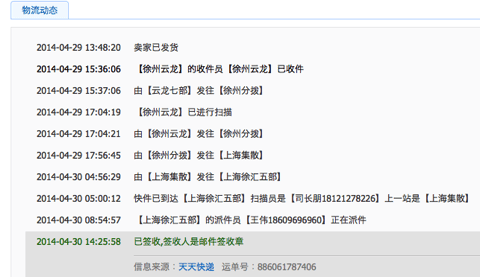 Anyway, this is what I want to share today : The efficiency of the courier service in China. I ordered on the 29th and it reached my freight forwarder on the next day. Barely past 24 hours. And this, the package travel a few hundred kilometres across provinces in 2 days?! And consider this. I placed the order on a Saturday night. They got it shipped out on a Sunday morning. And yes, the couriers work on Sundays. This is the best part. When the packages arrive at my forwarding agents, they will ship the orders to Singapore. I submitted this order to forward the package on the night of 30th April. May 1st is supposed to be a major holiday in China. I totally expect the package to be processed on May 2nd or later. I can understand. And guess what, I saw a notification this morning. They have processed my order. ON A MAJOR HOLIDAY! Can you not say they are first class?! But wait. Here comes the disappointing part. Who’s the weakest link? Our local couriers. This what something I shipped last week. Out of Shanghai by 26th and in Singapore on the 28th which is a Monday. And I’m still waiting. Going by the status, I doubt I will be getting my package this week. I seriously wonder why they are sitting on the package. This is not my first experience with local couriers. I have use several and all of them are equally bad. They don’t deliver after official hours, they don’t turn up on time. etc. Compare them with the folks in China, it’s seriously miles of difference.